The unofficial band leader was Fatz Geronimo, the gorilla in the gold tuxedo. 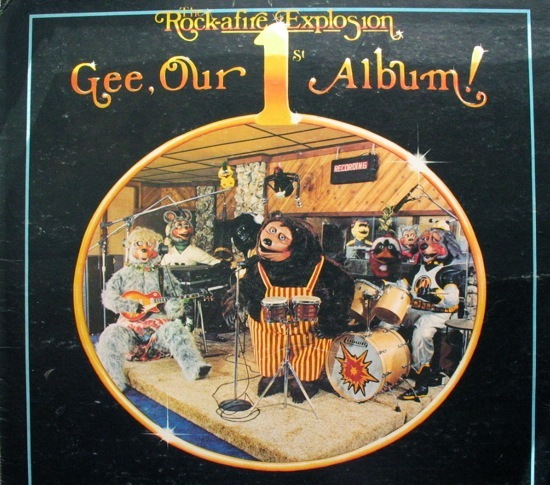 Now wait, are you saying that there was an actual place called Showbiz Pizza Place and that you won this LP there? But the place didn’t look like what this a cover looks like, right? All the singing and playing animals? I’d have a heart attack and jump on a plane right now if so despite the fact that singing and playing animals oftentimes annoy me. though these look pretty great and look like they were made with loving care an attention to detail. I love some of the shots on the back cover, especially the little girl kissing that amazingly wide fur thing and then the giant 24 track mixing board next to it with the plaid suited animal most likely trying to figure out how to cup his paw around one of the knobs. 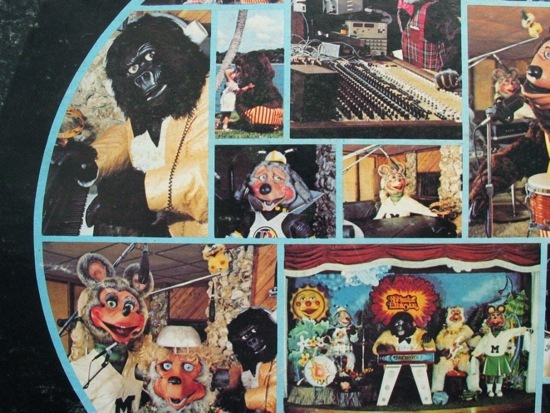 Yes, there was an actual place called Showbiz Pizza Place (later taken over by and absorbed into Chuck E. Cheese, unfortunately)! There was a stage with an animatronic animal band (the one in the photos!) along with arcade games (whac-a-mole, skee ball, etc) and dining area. You got tokens to play the games and would win tickets which you could exchange for toys and prizes. I don’t remember for sure, but I’m pretty positive I probably exchanged some of my tickets for this LP. I went to a birthday party at a Showbiz Pizza as a kid and those slightly moth-eaten animatronics kinda scared the crap out of me! Pretty sure I enjoyed the arcade, though, I was always up for a giant ball pit as a kid. 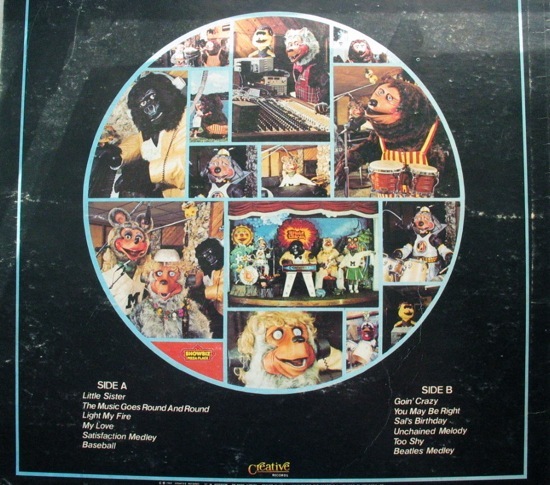 Allee, Showbiz Pizza looked EXACTLY like this record. Not sure how I missed out on a place called Showbiz Pizza with such zaniness going on inside but it appears that I did. Sounds like I was too old to go to it as a kid but even in my adult years I’ve been attracted to crazy places like this. I would like to go right now! Thanks for sharing that website Nessa! I hadn’t seen that one before. Wow, the mice with the really red faces are killing me. No wonder there were some kids that left in tears. I would have killed to go to Showbiz Pizza. Do you still play the lp? If I had a working record player I would put it on right now. Sadly, I haven’t had access to one in a while, so haven’t listened to this in years. I think a lot of the animatronic characters were auctioned off after the chain was closed. They can be re-programmed and everything. So entertaining, and wonderfully creepy! So great that they’re auctioned off so people who love them can keep them going.